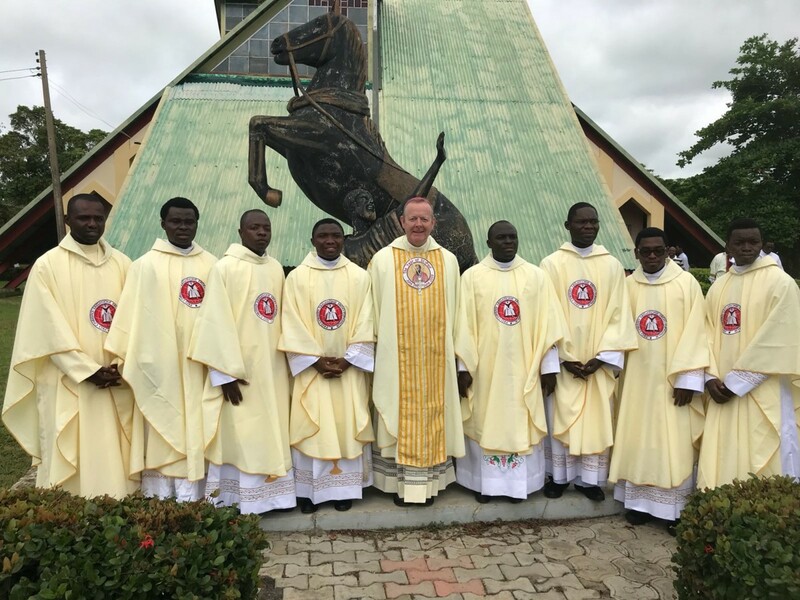 On Saturday 23 June, Archbishop Eamon Martin ordained eight priests for the Missionary Society of Saint Paul in Nigeria. The open air ordination Mass was celebrated at the National Missionary Seminary of Saint Paul outside Abuja, the capital city of Nigeria, and was attended by thousands of family and friends of the ordinands. Speaking after the ordinations, Archbishop Martin said, ‘It has been a great joy for me to preside at such a significant moment for the Church in Nigeria. Everywhere I go I sense the deep gratitude felt here for the Irish missionary priests and religious who contributed immensely to society and the Church here. Archbishop Martin is not the first Archbishop of Armagh to participate in the ordination of MSP seminarians. In 2006 Cardinal Seán Brady was invited to Nigeria to ordain ten MSP priests. Bishop Leo O’Reilly, Bishop of Kilmore, ordained MSP priests in 1999 and previously taught at the seminary in Nigeria. Many Kiltegan Fathers also worked in Nigeria and were instrumental in the initial formation and growth of the MSP. The Missionary Society of Saint Paul holds a strong connection to Ireland, and refers to members of Saint Patrick’s Missionary Society (Kiltegan) as their ‘ancestors in faith’. In addition, over the years, MSP members have studied in Ireland during their formation. Bishop Hyacinth Egbebo MSP, Apostolic Vicar of Bomadi, formerly served in Saint Patrick’s Parish, Dundalk, in the Archdiocese of Armagh, before returning to Nigeria. There are currently eight MSP priests serving in Ireland in the dioceses of Armagh, Ardagh & Clonmacnois, Elphin and Kilmore. Father Anselm Emechebe, one of three MSP priests serving in the Archdiocese of Armagh, and Mission Superior in Ireland, accompanied Archbishop Martin on his journey to Abuja. The Archdiocese of Armagh also sponsors a number of the seminarians in their student training, as well as an MSP priest in his postgraduate doctoral studies in Rome; he is based in the Pontifical Irish College. The Missionary Society of Saint Paul was founded by the late Dominic Cardinal Ekandem and was established by the Catholic Bishops’ Conference of Nigeria on Mission Sunday 23 October 1977. There are close to 300 MSP priests working in 19 countries across Africa, Europe and the Americas. There are also 100 seminarians in formation in the National Missionary Seminary. For more information, please see www.mspfathers.org.